KINGSTON, Ont. 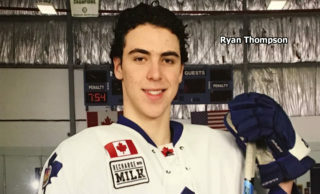 – Mathew Santos’s power-play goal at 19:56 of the second period proved the winner as the North Bay Battalion downed the Kingston Frontenacs 4-1 Friday night for a split of a two-game Ontario Hockey League road trip. Nick Paul, Brett McKenzie and Mike Amadio, into an empty net, had the other goals and Alex Henriksson and Marcus McIvor earned two assists apiece for the Battalion, which moved its won-lost-extended record to 9-3-4 for 22 points, first in the Central Division. Goaltender Jake Smith made 22 saves. Spencer Watson scored for Kingston, 7-7-1 for 15 points, third in the East Division. Goaltender Lucas Peressini faced 30 shots before 4,797 at the K-Rock Centre. 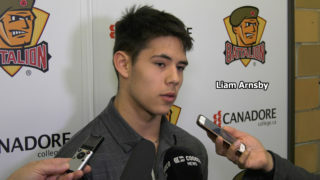 The Battalion rebounded after a disappointing last-minute 2-1 loss Thursday night to the Peterborough Petes. A third consecutive away game, Sunday against the Ottawa 67’s, was postponed because of problems with the ice at TD Place. The Troops took advantage of a delayed penalty call to open the scoring at 11:49 of the second period as Paul put a wrister over Peressini’s blocker from the inner edge of the left-wing circle. Zach Bratina and McIvor earned assists on Paul’s team-leading 14th goal of the season. Santos struck late in the frame as Kingston was unable to clear its zone. Henriksson lofted a backhander through traffic that Peressini stopped, but Santos converted the rebound. The Frontenacs had eight shots at Smith. 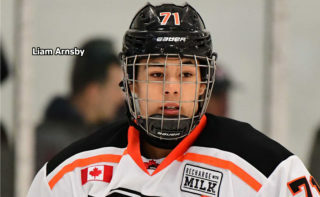 Their best chance came in the second minute, when Smith stopped a Samuel Schutt shot off a left-wing rush and Corey Pawley failed to corral the rebound. A fine defensive effort by McKenzie stymied Robert Polesello’s attempt to break in alone in the 12th minute. McKenzie made it 3-0 during a two-man advantage at 3:13 of the third period, burying a Henriksson feed on a backdoor play at the right post. Watson ended Smith’s shutout bid at 15:54, redirecting Jacob Graves’s shot from the right point. Peressinni went to the bench for a sixth skater with 2:20 left to play, and Kingston began a prolonged assault. Smith grabbed a Lawson Crouse feed in the goalmouth to quell a two-on-one rush with 1:24 left. 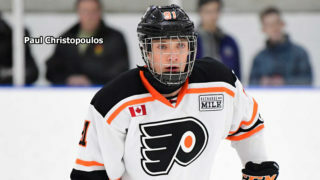 In the final minute, the goaltender got his stick on a Polesello shot from the lip of the crease and sprawled to cover Watson’s attempt at the rebound. Smith found an Evan McEneny right-point shot through traffic, and Crouse fired a loose puck off the right post. Amadio connected into the empty net at 19:39 for his fourth goal. The first period saw the Battalion forge an 8-5 edge in shots. Each team had one power play without generating sustained offence. The Frontenacs enjoyed the best scoring chance when Ryan Kujawinski cruised across the goalmouth, forcing Smith to make a fine save with his left pad. 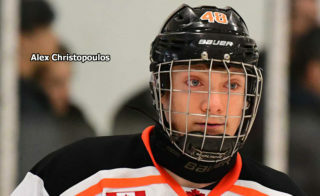 Paul made Peressini react quickly with a shot from the blue line that bounced off the end boards and skittered back into the crease, where it hit the back of the goaltender’s right leg. The Battalion hosts Peterborough at 7 p.m. next Friday. 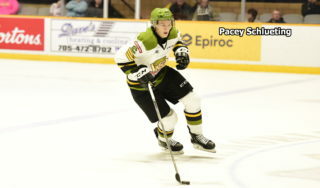 BATTALION BULLETS: The Battalion wore white as the Frontenacs sported green camouflage-style sweaters and socks for a game preceded by ceremonies related to Remembrance Day. Among those conducting the ceremonial faceoff was Brigadier-General Al Meinzinger, commandant of the Royal Military College. There was a heavy military personnel and family presence in the crowd … The Petes accommodated the Troops’ road packing by wearing new black-based sweaters Thursday night … Shawn Tessier, traded to Kingston on Sept. 15, faced his former teammates for the first time … John Goodwin, a Battalion assistant coach last season, now works with Kingston under first-year head coach Paul McFarland … The Troops’ Brenden Miller, who drilled the puck off the crossbar in the second period, had career-high four-game goals and points streaks snapped. He had four goals and two assists for six points in the span … The Battalion went 2-for-6 on the power play. Kingston was 0-for-4 … Hampus Olsson fought Kingston’s Conor McGlynn in the third period … North Bay, which dressed 11 forwards and seven defencemen, was without Riley Bruce, Zach Poirier, David Sherman and Calvin Gomes … Polesello saw the end of a seven-game points streak in which he had six goals and seven assists for 13 points.